Things happen fast around Oxbow Public Market. There’s always something new happening from a fresh new product, a new menu, or a festive event. Ranked one of America’s best public Markets by Frommers, Oxbow has become THE gathering place for food and wine in the Napa Valley and downtown Napa. The 30,000 square foot marketplace, which includes a scenic outdoor deck with seating along the Napa River, features a diverse tenant mixture of local food vendors, artisan cafes and organic farm stands. 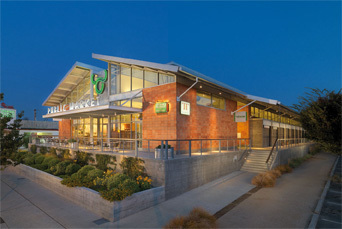 The Oxbow Public Market is open seven days a week from early morning through early evening. Locals and visitors shop for sustainably farmed regional produce, ethnically diverse ingredients, olive oil and condiments, fresh pasta, flowers, coffee, teas, herbs and spices, in addition to goods from the meat markets, fish mongers, cheese store, wine shop, coffee bar, and bakeries. Specialty non-food retailers feature cutlery, tabletop, glassware, and candles. You’ll also discover classic Wine Country restaurants and cafes offering a variety of dining, both in-house and to-go, in addition to a broad scope of foodstuffs, both prepared and ready to cook, allowing shoppers to plan and prepare a wonderful meal on-the-go or for home dining and entertaining. With over 150 small farmers operating nearby, “fresh from the source” is the benchmark. Famished patrons can enjoy al fresco dining on the deck overlooking one of the oldest rivers in California, the Napa River and Oxbow Preserve, which offers a wonderful picnic area and nature walking trails. Durning the summer months in the parking lot adjacent to Oxbow, the Napa Farmers Market is open Tuesday and Saturday from 7:30 to noon, May 1 through Oct. 30. Here, you’ll discover locally grown, farm-direct produce, gourmet food and handmade crafts. These popular farmstands provide the convenience of one stop shopping with the quality, freshness, and character for which Napa Valley is famous.